For several months an Internet Explorer 11 hang/crash issue plagued nearly half of the 15 load-balanced Citrix XenApp 6.0 virtual machines at our corporate headquarters. These servers are running Windows Server 2008 R2. When users would click links in Outlook, nothing would happen (from their perspective). When users tried to launch the Internet Explorer (Citrix) published application, if they landed on one of the affected servers, IE would appear to load, but then hang and ultimately crash and disappear. When I would test this via a full desktop session, I got the same result. Launch IE and it sits there for about 10 seconds and then quits. I was able to “fix” the problem by going to the Control Panel, clicking Internet Options, clicking on the Advanced tab, and then clicking the Reset button. But, this was only a temporary fix, as the problem would come back shortly after. I had nearly given up trying to figure out how to fix this issue, and was going to re-deploy several new virtual machines. Then while googling this issue one last time, I came across a different but similar problem, and it was suggested that User Account Control (UAC) should be configured to “Never Notify.” Well, one small problem, that is exactly how UAC is configured on all our Citrix servers. But, on a whim, I decided to change the UAC setting up one notch and then back down to “Never Notify” and guess what? Problem fixed! Internet Explorer now launches without issue. To change UAC settings, click the Start menu, then type UAC in the Search programs and files box, then click Change User Account Control settings in the search results. 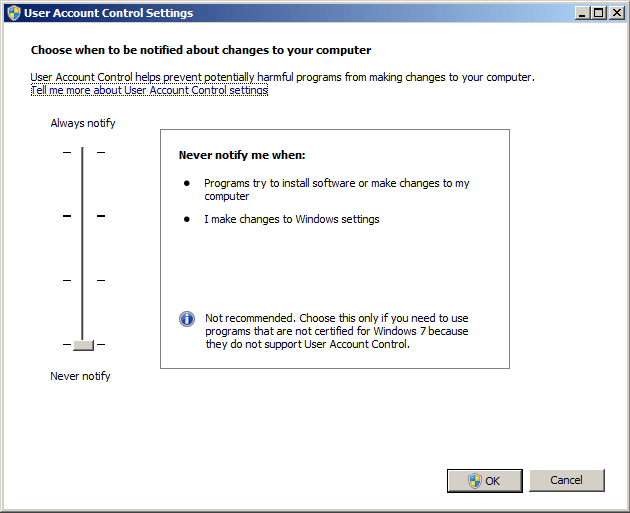 Alternatively, UAC can be accessed via the User Accounts icon in the Control Panel.